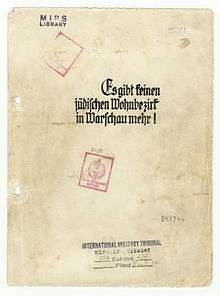 The cover page of the "American copy" of The Stroop Report with International Military Tribunal in Nuremberg markings. 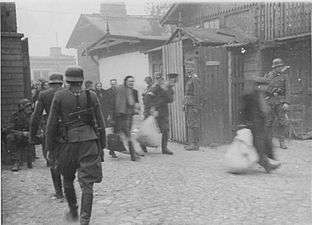 The second copy of The Stroop Report from Institute of National Remembrance in Poland. 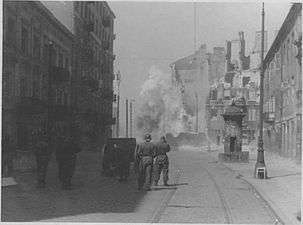 The Stroop Report is an official report prepared by General Jürgen Stroop for the SS chief Heinrich Himmler, recounting the German suppression of the Warsaw Ghetto Uprising and the liquidation of the ghetto in the spring of 1943. 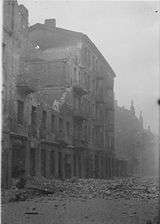 Originally titled The Jewish Quarter of Warsaw is No More! 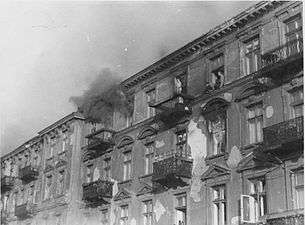 (Es gibt keinen jüdischen Wohnbezirk in Warschau mehr! ), it is commonly referred to as "The Stroop Report". 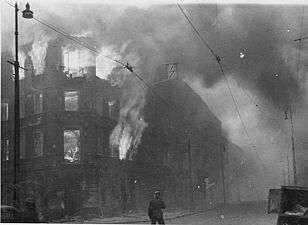 The Report was commissioned by Friedrich-Wilhelm Krüger, high SS and police leader in Kraków and was intended as a souvenir album for Heinrich Himmler. 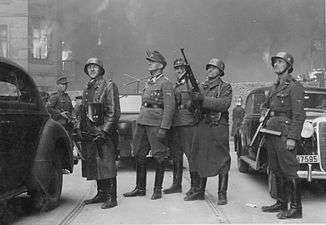 It was prepared in three distinct leather-bound copies for Heinrich Himmler, Friedrich Krueger and Jürgen Stroop, with one unbound file copy of the report (das Konzept) remained in Warsaw, in the care of Chief of Staff Max Jesuiter. 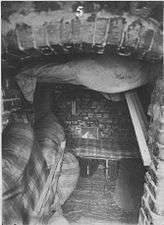 According to statement given in 1945 by Stroop's adjutant Karl Kaleshke, to US authorities in Wiesbaden, he ordered Stroops copy of the report burnt with other secret documents in Burg Kranzberg. 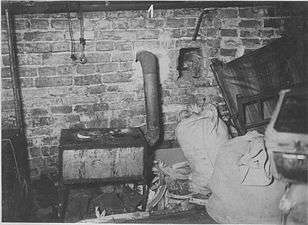 After the war only two of the four copies were discovered, those belonging to Himmler and Jesuiter. 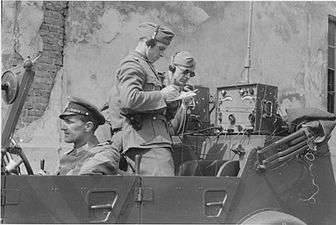 Himmler's copy went to Seventh Army Intelligence Center (SAIC) and Jesuiter's to Military Intelligence Research Section (MIRS) in London. 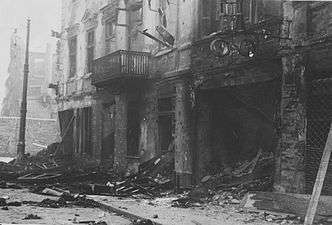 Several sources stated that German Bundesarchiv also had a copy in Koblenz. 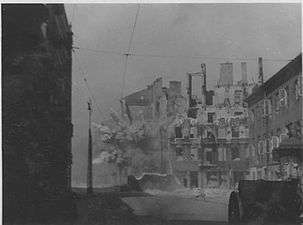 However, in reply to inquiries by Richard Raskin, Bundesarchiv stated that third copy of report was never in their possession. Both copies were introduced as evidence at the International Military Tribunal in Nuremberg, sharing the document number 1061-PS, and used in the trial as "US Exhibit 275". It was first displayed by the chief U.S. prosecutor Robert H. Jackson for the judges during his opening address. The assistant prosecutor dealing with the persecution of the Jews referred to it as "the finest example of ornate German craftsmanship, leather bound, profusely illustrated, typed on heavy bond paper ... the almost unbelievable recital of the proud accomplishment by Major General of Police Stroop." 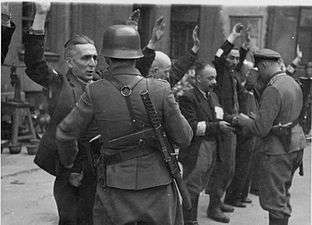 Both copies were also used in Nuremberg in the 1947 trial of Oswald Pohl as exhibit 503. 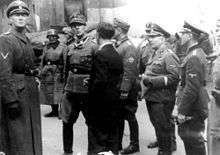 On June 10, 1948 the Himmler/SAIC copy of the Stroop report and Katzmann Report were handed over by Fred Niebergal, head of Office of Chief of Counsel for War Crimes – OCCWC, to Bernard Acht, head of Polish Military Mission in Nuremberg. It was used in Jürgen Stroop trial at Warsaw Criminal District Court in July 1951, and transferred afterwards to KC PZPR archive. 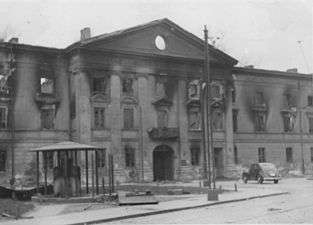 In 1952 it was transferred to Główna Komisja Badania Zbrodni Hitlerowskich w Polsce (Main Commission for the Investigation of Nazi Crimes in Poland) archive and it successor Institute of National Remembrance (polish:Instytut Pamięci Narodowej or IPN) where it remains. In 1948 Jesuiter/MIRS copy of the report went to National Archives (NARA) in Washington, D.C., where it remains. 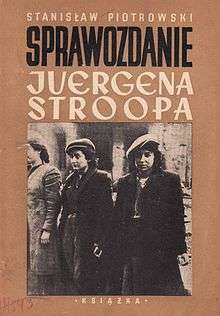 First book edition of "Stroop Report" from 1948 by Stanisław Piotrowski. Collection of 31 daily reports (German: Tägliche Meldungen), sent from Stroop's Chief of Staff Max Jesuiter to SS Police Leader East Friedrich-Wilhelm Krüger. The reports cover period of 20 April to 16 May 1943, plus a report from May 24, 1943, and were all signed by Jesuiter. 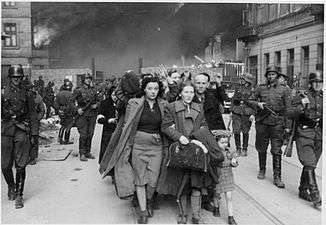 NARA report also have fourth section with statistics about human losses, types of recovered weapons and amounts of money and valuables taken from Jews. There are slight discrepancies in textual and graphical layout, and in the photographs they contain. 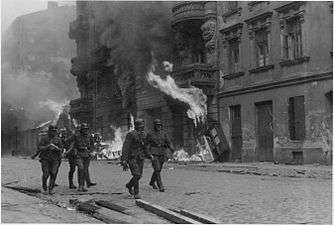 "When we invaded the Ghetto for the first time, the Jews and the Polish bandits succeeded in repelling the participating units, including tanks and armored cars, by a well-prepared concentration of fire. ... 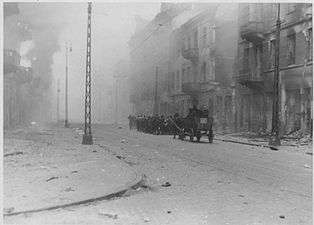 The main Jewish battle group, mixed with Polish bandits, had already retired during the first and second day to the so-called Muranowski Square. 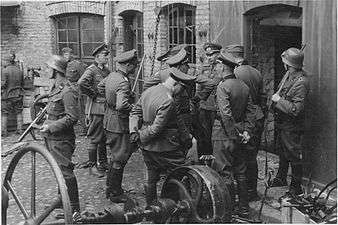 There, it was reinforced by a considerable number of Polish bandits. 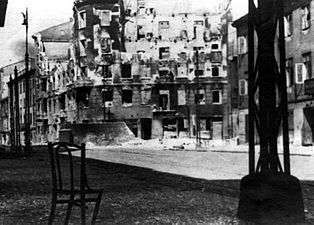 Its plan was to hold the Ghetto by every means in order to prevent us from invading it. 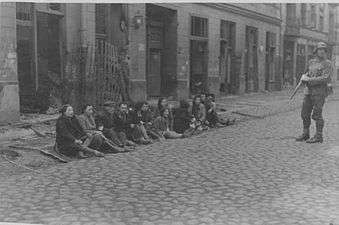 ... Time and again Polish bandits found refuge in the Ghetto and remained there undisturbed, since we had no forces at our disposal to comb out this maze. 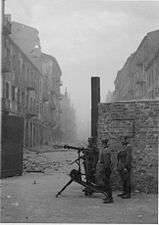 ... One such battle group succeeded in mounting a truck by ascending from a sewer in the so-called Prosta [Street], and in escaping with it (about 30 to 35 bandits). ... 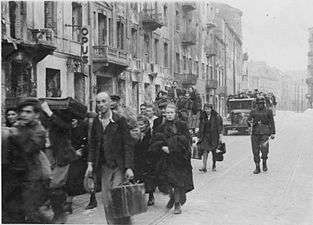 The bandits and Jews – there were Polish bandits among these gangs armed with carbines, small arms, and in one case a light machine gun – mounted the truck and drove away in an unknown direction." 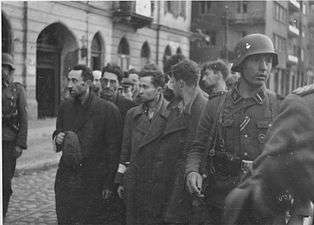 5 page of Stroop Report describing German fight against "Juden mit Polnischen Banditen" - "Jews with Polish bandits". Page describing military actions on 27 April 1943. 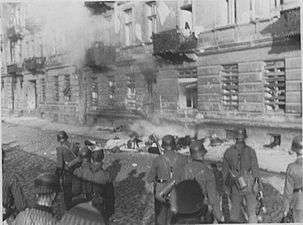 Continuation 27 April 1943 describing fight against a "jüdisch-polnische Wehrformation" ("Jewish-Polish combat formation"). The IPN copy of the report has 53 photographs on 49 pages, while the NARA copy has the same number of photographs on 52 pages. There are 37 photographs that appear in both copies, although not always with the same size, crop or order and occasionally with different captions. Sixteen shots in each copy are different, although often very similar as they depict the same events. All together, in both versions of the report there are 69 unique photographs. 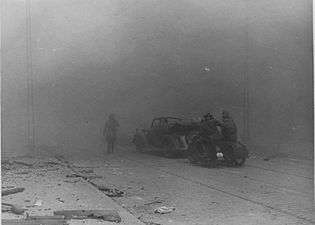 The identity of the photographers who accompanied Stroop’s headquarters during the operation is unknown. 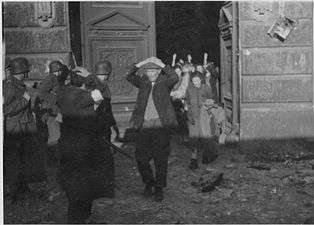 Franz Konrad confessed to taking some of the photographs, the rest were probably taken by photographers from Propaganda Kompanie nr 689. 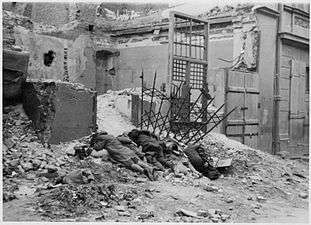 In addition to the photographs found in the reports there were about 45 additional photographs that were not included which according to Yad Vashem were found in Stroop’s possession when he was captured by the Americans after the war. 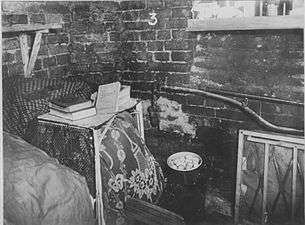 Some of those photographs were closely related to the ones used in the report as they depicted the same events. Many of those additional photographs are described in reputable sources as coming from the Stroop Report, even if they do not appear in either one of the actual reports. 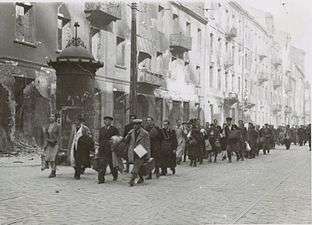 The high-quality photographs taken for Stroop constitute a unique documentation of the final stage of liquidation of Warsaw ghetto. 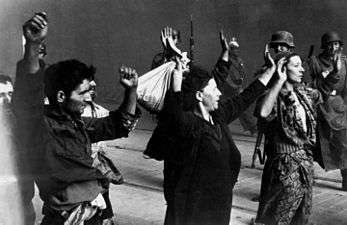 The photographer was permitted access to Stroop's inner circle, to accompany the forces that participated in liquidating the ghetto, and to get close to the combat areas. 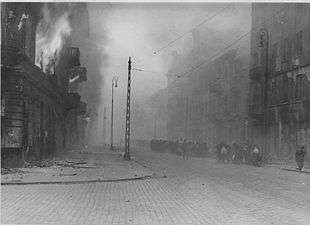 Apart from a dozen candid photographs taken by Polish firefighter Leszek Grzywaczewski, those are the only photographs of the Ghetto Uprising taken inside of the Ghetto. 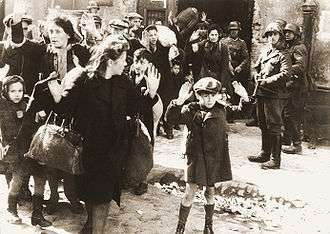 Some of them became highly recognized images of World War II and the Shoah. Photographic captions in the Report are often highly racist and contain little facts about their content, but are a good reflection of the mindset of the report's authors. They are written in the German Sütterlin script, and in some cases do not match the images. Despite a lack of any information about image content, many depicted places, people and events were identified in the years since the reports publication. 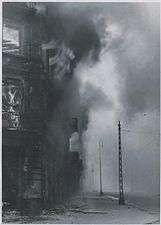 Photographs included in one of the two copies of the Stroop Report. 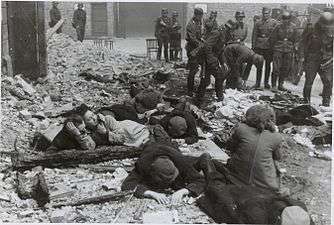 Image captions include a reference and translation of the original German caption (in red) followed by current photo caption. 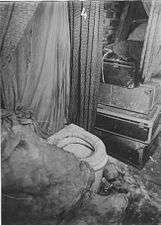 Click on images for more information. 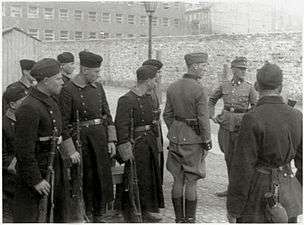 Guard on the left is Josef Blösche. 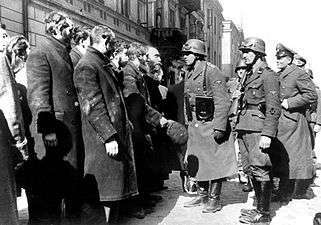 Rabbi Heschel Rappaport and others questioned by Heinrich Klaustermeyer and Josef Blösche in front of Nowolipie 32. 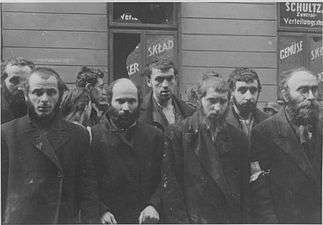 Rabbi Lipa Kaplan, Eliyahu Levin, Mendel Alter, Yankel Levin and Rabbi Heschel Rappaport in front of Nowolipie 32. 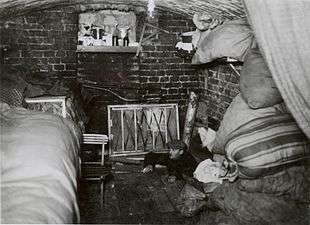 All the prisoners were stripped during the search. 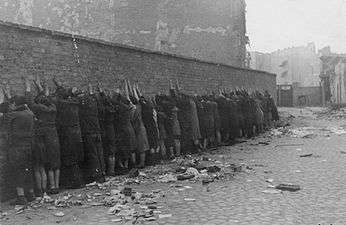 Executed Jews, possibly near Nalewki 41. Hehalutz women captured with weapons. 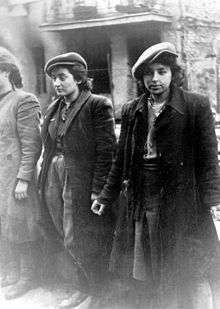 Małka Zdrojewicz Horenstein on the right survived Majdanek and Bluma Wyszogrodzka in the center died in Auschwitz. 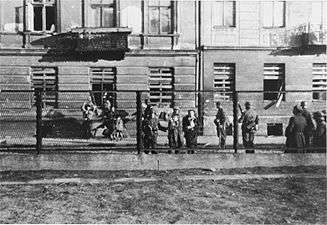 Captured Jews in front of Miła 31 and 33 viewed from Zamenhofa Street. 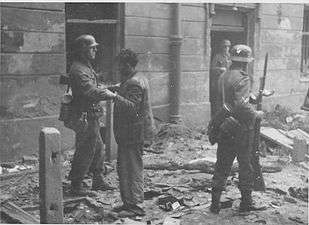 Captured Jews are led by Waffen SS soldiers to Umschlagplatz. In the back Nowolipie 62 & 63. See file page for possible identity of depicted people. Column heading North to Umschlagplatz on Zamenhofa Street near Kupiecka. In the back buildings of Zamenhofa 30-40 block. Column heading North to Umschlagplatz on Zamenhofa Street near Wołyńska. On the left 25, 27, 29. 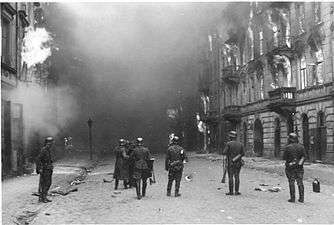 Column heading North to Umschlagplatz on Zamenhofa Street, with burning Zamenhofa 25 / Wołyńska 2 on the left. 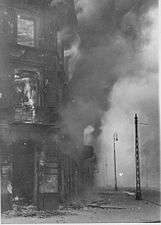 Zamenhofa Street looking North, with burning Zamenhofa 25 / Wołyńska 2 on the left. 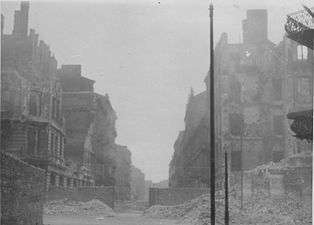 Zamenhofa Street between Wołyńska and Miła looking North, with burning Zamenhofa 29, 31 and 33 on the left. 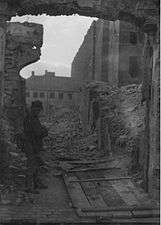 MG08 at the gate on Nowolipie Street intersection with Smocza Street, looking East. In the back Nowolipie 56. Nowolipie 56 in the center. Nowolipie Street looking West towards the gate at Nowolipie / Smocza intersection. 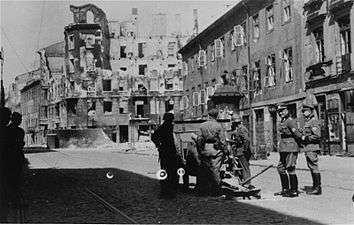 Waffen SS troops at Nowolipie Street with Nowolipie 50 A, 52, 54 and 56 in the back. 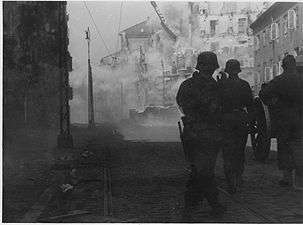 Waffen SS troops at Nowolipie Street, between Smocza and Karmelicka Streets, with Nowolipie 34 on the right. Stroop Collection, not in the report. Men preparing to commit suicide by jumping off the upper floors of 23 and 25 Niska Street. Man committing suicide by jumping off the upper floors of 23 and 25 Niska Street. 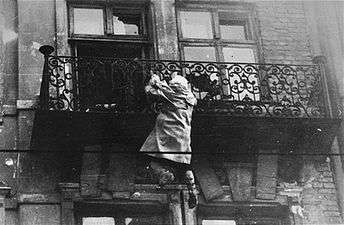 People who committed suicide by jumping off the upper floors of 23 and 25 Niska Street. People preparing to commit suicide by jumping off the upper floors of 23 and 25 Niska Street. 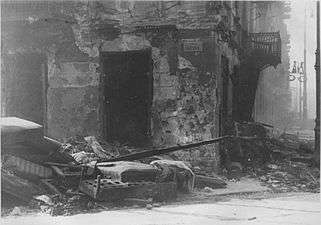 Stroop near command car, probably at Zamenhofa 48 near intersection with Miła. 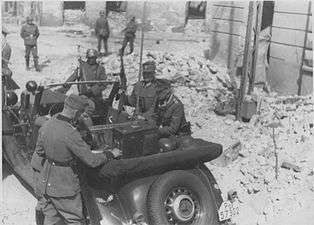 Stroop and foreign fighters at the Umschlagplatz, with Stawki 5/7 in the back. 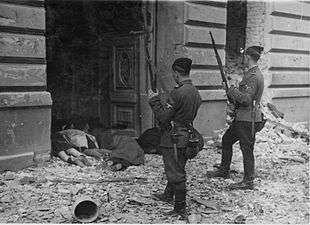 Foreign fighters and executed Jews at Zamenhofa 42 / Kupiecka 18. Ulica Kupiecka Street viewed from Zamenhofa, with Zamenhofa 42 / Kupiecka 18 on the left. Nalewki Street, looking South from the gate at Nalewki/Gęsia/Franciszkańska intersection. Nalewki Street, looking South at the gate at Nalewki/Gęsia/Franciszkańska intersection. Beyond the wall on the right Posner house at Nalewkach 29. 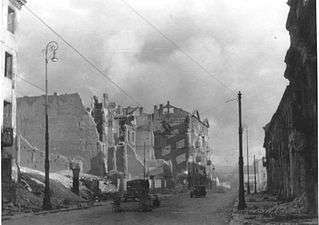 On the right Nalewki 31/Gęsia 2, and on the left a view South at Nalewki Street towards ghetto gate at Nalewki/Gęsia/Franciszkańska intersection. On the left Nalewki 31/Gęsia 2, and on the right view North at Nalewki Street. Possibly Nowolipki / Smocza intersection looking West on Nowolipki Street. 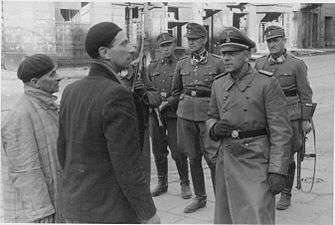 Stroop and Josef Bloesche questioning a Jewish Prisoner-possibly taken same time as NARA 21 and IPN 20 above? 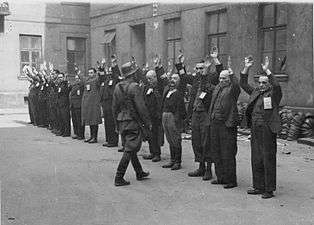 This and the following 6 photographs show Jews being captured by the Germans-possilbly related to NARA 20 and NARA 38 pictures above? 1 2 3 4 5 6 7 8 9 10 Tomasz Stempowski (March 17, 2013). "Zdjęcia z powstania w getcie". fototekst.pl. Retrieved October 8, 2013. 1 2 3 4 5 Jürgen Stroop (2009). Andrzej Żbikowski, ed. Żydowska dzielnica mieszkaniowa w Warszawie już nie istnieje! 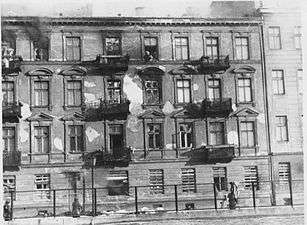 / Es gibt keinen jüdischen Wohnbezirk in Warschau mehr! (PDF). 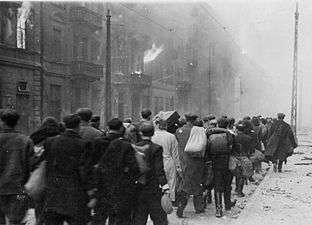 Warsaw: Instytut Pamięci Narodowej, Żydowski Instytut Historyczny. pp. 10–18. ISBN 978-83-7629-455-1. 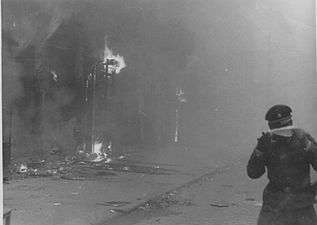 ↑ Conot, Justice at Nuremberg, 1983, pp. 269-70. ↑ Jürgen Stroop, "Es gibt keinen jüdischen Wohnbezirk in Warschau mehr! ", Warschau 1943, p.5. 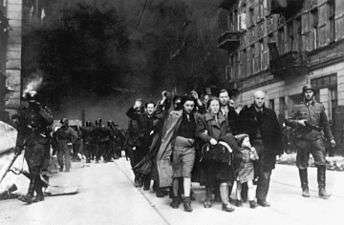 1 2 Jürgen Stroop, "Es gibt keinen jüdischen Wohnbezirk in Warschau mehr! 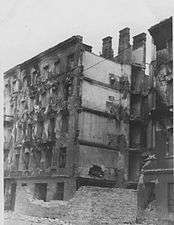 ", Warschau 1943. ↑ "The Stroop Collection". Yad Vashem. Retrieved 11 April 2016. Wikimedia Commons has media related to Stroop Report.